Spring break is neither spring nor a break…discuss. Seriously though. I said goodbye to my students on Tuesday for the next two weeks and it hardly feels like anything. I’m not planning a giant road trip like last year, or excited about sleeping in, getting my hair done, and catching up on TV shows like I used to do during Spring Break when I was teaching middle school. For me, Spring Break is just more of the same–write, write, write. The last couple of weeks have been tough. I actually had two different blog posts composed that I deleted because they sounded too depressing. I’ll be honest when I admit that I didn’t know how lonely writing could be. Now I know why authors are so depressed sometimes–you get stuck in one world for such a long time and that can really mess with your head. 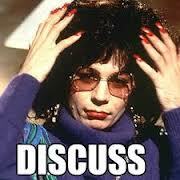 No joke, I dreamed about curriculum integration last night. I dreamed that I went back to Lanley Elementary and interviewed the teacher and students again. I don’t get a break from thinking. Usually teaching gets me out of whatever funk I’m in because I get to escape the house, focus on other people, and do something creative, and that is a great recipe for inspiration and a refreshing new outlook. However, the last couple of weeks the commute has been so anxiety-inducing thanks to the insane winter we’ve been having that I can’t get inspired to teach either. I also got the news that I was not offered either of the jobs I interviewed for at CMU, which was a major bummer. Yesterday, I forced myself to get out of the house and get out of my head space. I went with my friend and former colleague Tiffany to visit the school where we used to teach. I still have several friends there, so we grabbed lunch and brought it to the teacher’s lounge like old times’ sake. Everyone always says never to eat in the teachers’ lounge, but I never subscribed to that theory. It’s different when you work with your best friends. The week before, I drove out to Tiffany’s school in Grand Rapids where she is now an administrator and volunteered to do a center in a Kindergarten classroom for the 100th day of school. I had fun in both cases, but it made me miss K-12 teaching! Missing the little ones combined with the fact that I now have no real job prospects on the horizon, makes me think that if I were offered an elementary teaching position right now I would take it. 🙂 So it the experiences me nostalgic and worried more than inspired. Mike has been nothing but encouraging during these rough weeks. He reminds me constantly that something will happen for me and tries to keep me positive. He reminded me last night that worrying about job prospects, or snow days, or whatever just detracts from the dissertation writing and I’m coming up on the home stretch. He indicated that I have forgotten a bit that writing the dissertation and just completing this 5-year journey of a PhD program is such a huge deal in and of itself. So, time to embrace my reclusive writing self. I made another timeline today that is now broken down into weeks, not months. And, there are only 8 of them left. A good thing that came out of these last two weeks is that I sent off two more chapters for Anne-Lise to read. 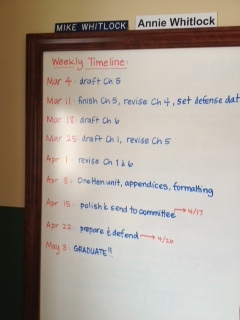 I have plans in March to write the other 3 chapters with a tentative goal to defend at the end of April. I’m also making plans for a May 3 graduation. This is happening regardless and that’s definitely something to be happy about. The month of March begins tomorrow, and even though the above picture indicates that I have a lot of work to do next month, March has always been my favorite month. It means warmer weather, marks the beginning of another great year in my life, and indicates the end of the school year is near. It means spring and new-ness, and I am so so ready for it to be here. Today I taught my intern class and the scheduled syllabus topic was “Teaching Economics.” Of course, this is the time in the course where I become a bit self-indulgent and talk about my own research for a while. When this typically comes up with my seniors, I talk about what I believe to be true–that economics can be taught for civic engagement like any other discipline of social studies, that students typically considered “at-risk” or “too young” to care about global issues can actually discuss issues intelligently, that project-based learning and integrated curriculum can help students learn, can be more engaging for teachers and students, but also has its drawbacks. Before, I could only talk about what I believed to be true. Now that my data collection is complete, I can actually start finding evidence to back up what I believed to be true. Of course, what is “true” is relative to one’s experience. But that’s just it–now I have data to start forming stories about the students’ and teacher’s experience. So perhaps this makes no sense to anyone else but me, but the numbers across the top are the questions on the assessment and reading the cells vertically shows all of the students and how they performed. He even color-coded everything (we ARE soul mates!) to represent at a glance which questions had huge gains for certain students from pre- to post-test. 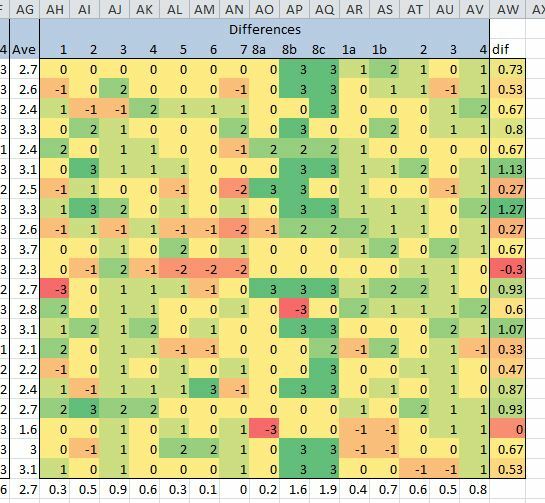 The numbers in the column on the far right represent the gains overall from pre- to post-test. Green is good. Red is bad. All of this took him about 15 minutes and it would have taken me days. Clearly, overall there is growth. There’s a lot of yellow, but a lot of shades of green as well. These results helped me decide which economic concepts to write about (the darkest green ones perhaps?) and which students to write about (dark green but also dark red–what might have happened there?). Right now, my biggest challenge is writing my “methods” chapter. This is where I have to write, in detail, the process I went through to make sense of the data. I attempted to write this chapter once earlier this fall, before I had actually figured out a system and it turned out to be quite the mess of verb tense, and not as specific as it will be when I give it another go now. It was difficult to write about something that, at that present time, was in the future, but to write it as past tense. Yikes.